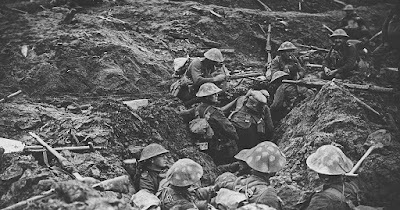 Nonsensible Shoes: History Repeating: Could the start of WWI instruct us now? History Repeating: Could the start of WWI instruct us now? With president Hollande of France speaking in terms last night of a pitiless war, something far more aggressive than the tone taken by president Bush, is France on the brink of a War on Islamic jihad and ISIS in particular? With British Prime Minister stating that France's fight was their fight as well, and Obama (incorrectly) stating that this was an attack on all humanity (really, it's an attack on the West and Western values by another faction of humanity), is an alliance forming, and war inevitable? Are we past the point of no return? What causes a war? Often the mirror of history looks at simple events first and later complexity is layered in. The cause of World War I was supposedly an assassination, but the reality around it, and leading up to the events that triggered the war was far more nuanced (excuse the progressive word that dismisses black and white explanations, but in this case it may have been true). The events that led up to the assassination are significantly more complicated, but most scholars agree that the gradual emergence of a group of alliances between major powers was partly to blame for the descent into war. By 1914, those alliances resulted in the six major powers of Europe coalescing into two broad groups: Britain, France and Russia formed the Triple Entente, while Germany, Austria-Hungary and Italy comprised the Triple Alliance. As these countries came to each other's aid after the assassination of Franz Ferdinand, their declarations of war produced a domino effect. Perhaps more important than the establishment of alliances is the fact that a singular event can have such a large ripple effect. Whether a war or terror is a good idea or not (and I believe it's simply a necessity at this point), what strikes me now is that this sure looks like history repeating. We would be wise to learn the lessons of history, if for no other reason than to understand the events that envelop us.